Japanese sword (Nihonto) is classified by the length of blade, Daito (either Tachi or Katana), is over two shaku (one shaku equals approximately 12" or 0.3 meters) in length. Shoto or Wakizashi is between one and two shaku. Tanto is normally under one shaku in length. The length of a sword blade is measured from the tip of the Kissaki in a straight line to the Munemachi. 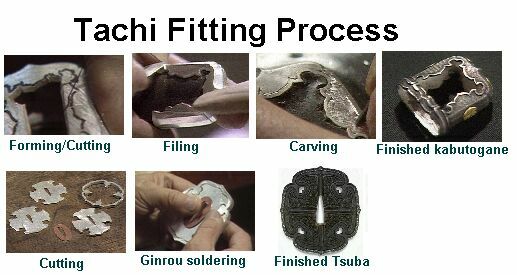 All fitting are made of soft metal such as Bronze, copper, silver, gold by Japanese Shirogane-shi (Craftsman or artist). 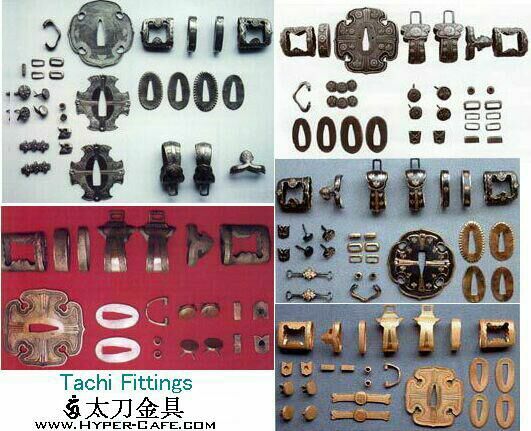 Tachi and Handachi fitting is hand made by Japanese Shirogane-shi (craftsman or artist of soft-metal fitting). Each set has kabutogane (kashira), fuchi, sarute, menuki (or makoto-menuki), sayaguchi (Koiguchi),ashikanamono, semegane (kashiwaba), ishizuki (kojiri), tachi-tsuba and others.